OSLO (Reuters) - Almost a quarter of Europe's bumblebees are at risk of extinction due to loss of habitats and climate change, threatening pollination of crops worth billions of dollars, a study showed on Wednesday. "Of the five most important insect pollinators of European crops, three are bumblebee species," said the IUCN, which groups governments, scientists and conservation groups. "Together with other pollinators, bumblebees contribute more than 22 billion euros ($30.35 billion) to European agriculture a year," it said in a statement. Of Europe's bumblebee species, populations of almost half are falling and just 13 percent are increasing, it said. Often with yellow and black stripes and bigger than honeybees, bumblebees live in small nests of up to 200 and do not make honeycombs. Some bumblebees are commercially bred to pollinate tomatoes, peppers and aubergines in greenhouses. "Climate change, the intensification of agriculture and changes in agricultural land are the main threats" to bumblebees, said the report, the first Red List assessment of threats to bumblebees. The European Union's top environment official said the 28-nation bloc was taking action to improve the situation. "The EU recently banned or restricted the use of certain pesticides that are dangerous to bees and is funding research into status of pollinators," said EU Environment Commissioner Janez Potoċnik in a statement. "However, efforts clearly need to be scaled up," he added. The IUCN study was funded by the European Commission. The study did not mention the possibility that honeybee diseases were spreading to bumblebees. A study in the journal Nature in February said that deformed wing virus, for instance, was found in both honeybees and bumblebees in Britain. The virus was more prevalent in honeybees, suggesting it was spreading from them to bumblebees. "In general, we don't know a lot about bumblebee disease," Stuart Roberts, a member of the IUCN's global bumblebee assessment team, told Reuters. "Some of these threatened bumblebees are isolated, living in the Arctic or the Alps," he said. "In those places the chance of picking up a disease from a honeybee is almost nil." 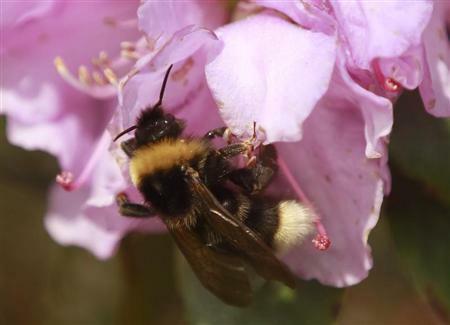 The Arctic species Bombus hyperboreus, living in the Scandinavian tundra and Russia, is vulnerable because global warming is shrinking its habitat, the study said. Populations of the critically endangered Bombus cullumanus, now found only in France, have fallen by more than 80 percent in the past decade, apparently because of a reduction in the amount of meadows with clover, its favorite forage, the study added. Only queen bumblebees survive the winter.